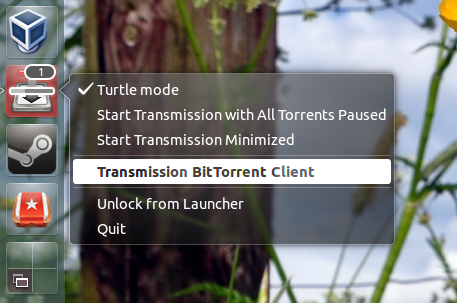 "Transmission-Unity-Launcher" is a python script that provides Unity launcher integration for Transmission BitTorrent client. For now, the script displays the number of downloads and total download progress but in the future it might get more features, like menu items to control the speed, start or stop torrents. And finally, open Nautilus, navigate to ~/.local/share/applications (~/.local is a hidden folder in your home directory so press CTRL + H to see it) and drag the Transmission icon onto the Unity launcher. 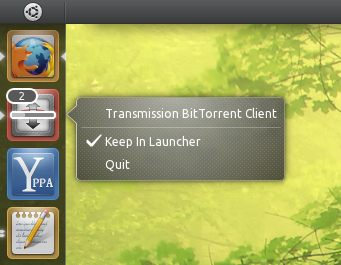 Now start Transmission using the new icon from the Unity launcher. If you're using a dock that doesn't support dragging the Transmission .desktop file from ~/.local/share/applications to it, you can simply double click the file to launch Transmission, then pin it to the dock. If you don't want to use my installation instructions above, you can manually download the script via GitHub.